180byTwo’s mission is to provide the industry with the highest quality data products and solutions. We’re accomplishing this each and every day by working closely with our clients, and partners handcrafting world-class audience solutions focusing solely on their needs, goals and objectives. 180byTwo’s handcraft Audience Solutions is collected from the industry’s premier data assets. We then leverage advanced insights and learnings to properlly label and categorize attributes for precise audience creation. Account Based Marketing (ACCOUNTLINK): The industry’s only location based ABM targeting solution covering more than 3 million active business / locations. Business Intent (ECHO): The industry’s most comprehensive B2B intent signals utilizing more than 25 billion online interactions. B2B Firmographics & Technographics (XPLORER): Providing B2B marketers with more than 700 audiences covering Industry, Profession, Technology on Site, Buying Authority and more. B2C Demographics, Lifestyle & Interests (COSMOS): An extensive collection of consumer audiences that include Demographics, Past Purchase, Life Events, Household income and more. Location-Based POI (LOCi): Target consumers based on their real-world behavioral patterns across more than 1100 audiences. Consumer Intent (4SEE): Reach consumers exhibiting strong purchase intent signals with over 900 segments created from the daily consumption and categorization of 120 billion pages. Custom: We handcraft custom audiences based on the clients requirements, across all audience categories to obtain the clients campaign objectives. 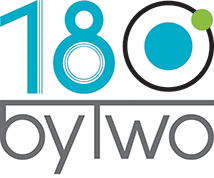 180byTwo’s accurate, authenticated and actionable data is compiled from a diverse global network of offline and online publishers, and qualified premium data partners. Unlike most other data providers, 180byTwo leverages all data types across online, location, offline, etc. across it’s 100+ terabyte data lake. We then handcraft audiences through the proper labeling and categorization of attributes and signals. We focus on quality data to support highly accurate programmatic targeting. The core of 180bytwo is our methodology of cross referrencing premium signals and packaging them properly. Targeting accounts (ABM) & key decision makers across channels. Reaching small business owners, or companies within certain Industries or Sizes. Create highly qualified audiences by mixing, matching and layering various signals, attributes and elements. Find look-alikes, or to create suppression filters. Conquesting based on customers who visited your competitor, or based on their keyword searches. We do not opperate in the EU. Our data however is derived from partners who are GDPR compliant.